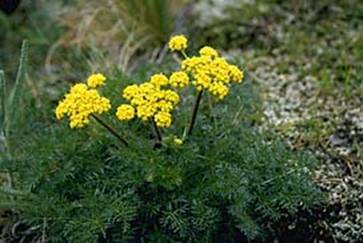 Additional common names describing lomatium include called hog fennel, spring gold, fineleaf desert-parsley, and bladder desert-parsley. A wide variety of bees, flies, wasps and beetles visit the flowers of Lomatium spp. and are likely pollinators. Open grasslands in northern and southern portions of the Puget Lowland and the adjacent Georgia Depression of B.C. Collect seed heads and allow them to air dry indoors for at least a week before cleaning. Crush the heads with a rolling pin to remove seeds from small pods, separate the chaff from seed. Seeds are best sown as soon as it is ripe in a cold frame. Stored seed can be rather slow to germinate, when sown in the spring it usually takes 12 weeks to germinate. Giving it a period of cold stratification might reduce this time. For cold stratification place seeds on moistened blotter paper, cover with second moistened piece of paper, place in zip-lock plastic sandwich bag and seal. Place bags in dark cold room for 12 weeks. Lomatium likely has a short seed life. Kaye (1992) found that Lomatium bradshawii does not reproduce vegetatively or maintain a persistent soil seed bank (most seeds germinate the year after they fall, leaving few for remaining years). However, germination trials at Berry Botanical Gardens included one and 13 year old seeds subjected to 8 weeks of cold stratification followed by alternating 50/68°F (10/20°C) both germinated at a rate of 80%, while a constant 68° F (20°C) resulted in 70% and 50% respectively. After 16 weeks cold stratification, one and 13 year old accessions yielded 70% and 90% germination respectively when subjected to the alternating temperature treatment, and 100% and 90% respectively at the constant temperature. The seedlings need to be pricked out into individual pots as soon as they are large enough to handle, and should be planted out into their permanent positions in the summer. Fresh seed can be sown immediately in situ. Division may be possible in spring or autumn. Plant mid-March in full sun, in a well drained soil. Water daily, with restricted water as plants mature. Brickell, C. 1990. The RHS Gardener’s Encyclopedia of Plants and Flowers; Dorling Kindersley Publishers Ltd.